Grandma did so much hard physical labor on the farm. Did she ever have time to sit down and put her feet up? I hope that she had a Royal Easy Chair (though my gut feeling is that the Muffly’s didn’t own any easy chairs). An aside: If you interested in reading my preliminary ideas, based on readers comments, about how to celebrate the end of Grandma’s diary in late December, there’s a new Friday Update on my author website, Sheryl Lazarus.com. Don’t worry if you don’t have time to look at this site–when it get’s closer to the end of the year, I’ll bring the ideas over to A Hundred Years Ago. Posted on October 17, 2014 October 18, 2014 by SherylPosted in AdvertisementsTagged 1914. She’s been so quiet lately something’s up!!! The original Lazy Boy chair! 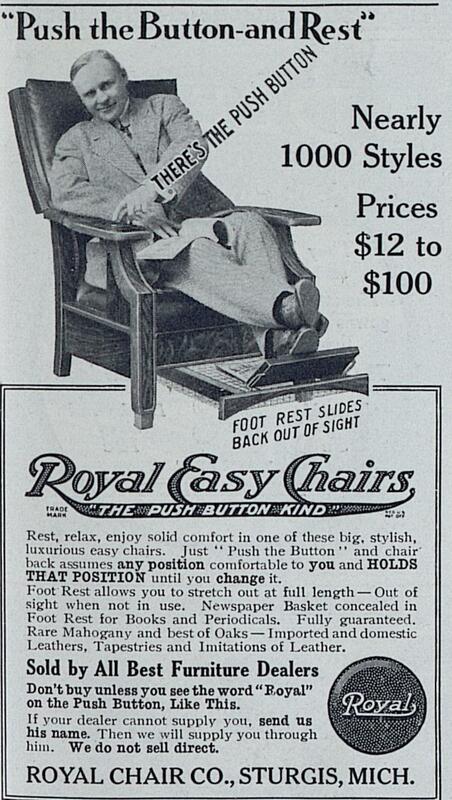 I was surprised that reclining chairs have been around for so long. I was too. And you will be amused that I went and bought one today. My first ever but it was on sale and too good a sale to miss. Oh, that sounds good! Mine won’t be delivered till next week. Can’t wait. I do think farmers and physical laborers loved this kind of chair! I have old photos of my father and grandfather snoozing in recliners. That looks so uncomfortable. EGAD. Is it me? I’m glad you like them. I think that the next couple months should be a lot of fun. I like the way the foot rest slides back and forth. It’s interesting how the design was very different from modern reclining chairs. I had not realised that this type of chair was around in those days. You educate without pain, many thanks. I’ve never see one of those. I have an old “Morris” chair that has the rod across the back and notches on either side, so you could recline the back. I learned something new. I never knew the name of that type of chair before. I’ve heard that it was named that after the inventor. I also was surprised that reclining chairs have been around so long. The price range is huge: $12-$100. I wonder how the $12 chair differed from the $100 one. I would love to know that too that is a wide price range for sure.